Direct Download iOS 4.3 for iPhone, iPad, iPod touch NOW ! The Latest iOS 4.4 Software Update with more features to your iPhone, iPad, and iPod touch. 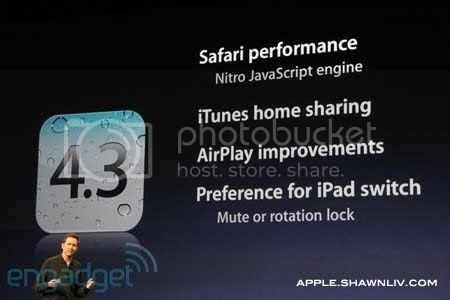 In brief, the update included AirPlay Enhancements (More ways to AirPlay), Safari Performance (Surf at the speed of fast), iTunes Home Sharing (Share over the air), iPad Side Switch (Switch it up) and Personal Hotspot for iPhone 4 (Get online in more places).